Bangkok is a jewel of a city – rich in history and alive with colour. 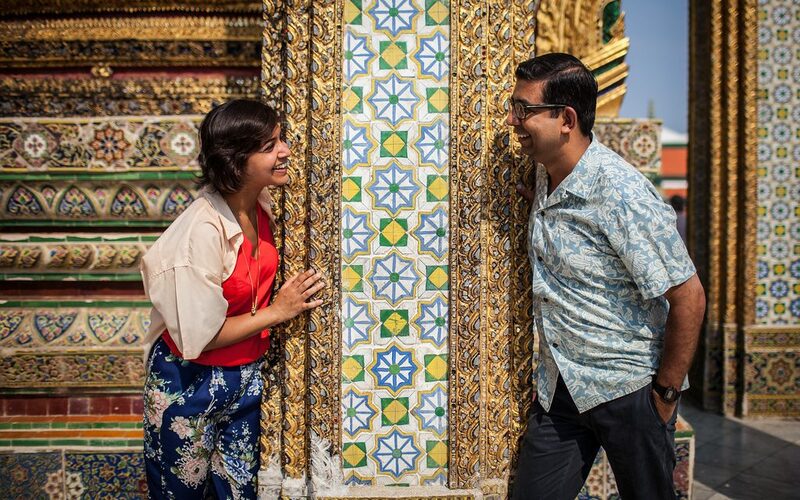 Travel bloggers Aditi and Aman of The Roaming Pear experienced one of its treasures – the stunning Grand Palace – with Flytographer Tom under the toasty Thai sun. “It was time for a vacation to a tropical, hot & humid location – far, far away from icy, snowstorm-stricken NYC! We had been planning our bucket list trip to Thailand for about a year. There is so much to see and do – temples, beaches, elephant (reservation) camp, street food (yep, worms and all! ), floating markets in the canals – wow! “Ever since I read about Flytographer, we wanted to sign up! This would be a perfect souvenir – and we wanted the photos to be bright, colorful and fun – after all, that’s the essence of Thailand, the land of smiles! 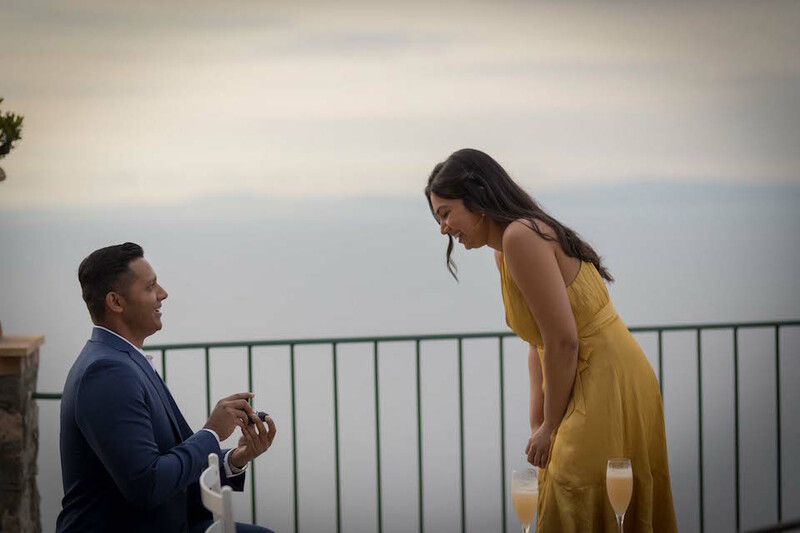 “We took the ferry to the Grand Palace [where we scheduled our shoot] and THAT was an experience in itself – we highly recommend it! When we got to the gates, a well dressed gentleman walked over looking concerned and insisted that the palace was closed for a ‘special event,’ and that we really should come back another day. In fact, we should go on a shopping trip with him and he would even get a taxi for us. How considerate! We had been forewarned and smelled a scam, ha! We thanked him profusely for his ‘kindness’ and decided to take pictures of the gate. He walked us there, but finally got the hint. And then we were off to find Tom! “Tom was absolutely incredible, and such a trooper for walking around the large grounds of the Grand Palace in the scorching heat! The photos turned out so amazing and exactly how we envisioned. Above all, he made us look like we were the only ones there, even though the place was swarming with tourists that day! Tom told us, “I had such a great time with them. Initially I was a bit panicky as there was an insane number of tourists visiting the Grand Palace at that time and I was scared we were going to miss each other at the entrance!